Concur with the most of the previous submissions in the lack of variety of ales would make us not rush back. It's situated in a lovely spot for walking or cycling as we were. We had a baguette for lunch which was very tasty. It was a midweek lunch and the place was very quiet but hopefully gets busier at weekends. Very personally I feel Fullers beers in general have been dumbed down over the years to meet the mass market and they would do well here to get some unusual guest beers in as I'm not the only the only one who feels this. Having said that they made a stout a few winters ago which was scummy but was so hard to find. Nice pub under yet another new team. They seem to have taken it just slightly more up market presentation wise - fresh flowers on the dining room tables and a bit more care with the food presentation. The beer is still very kept with a couple of real ales and a good choice of largers etc (so I am told as I don't often drink larger). Good value for money for the area with main meals from just under a tenner with a nice touch a small 6oz steak and chips available for just £10. All the staff were very friendly and you're welcome to bring your dog in with you so ideal pub after having been for a local walk. Most important for us. Pretty spit & sawdust for the area, a bit of a surprise. Only HSB & Pride on draught unfortunately. Nice staff and dog friendly. 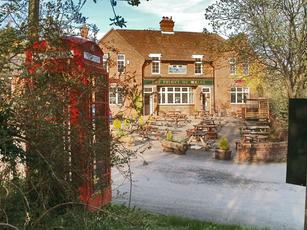 A strange pub in an offbeat spot. The beer was fine enough (not much variety, Gales HSB and London 'eggy' Pride) and service cheerful enough, yet the place is huge and was empty at 7pm on a Saturday. This is probably good news for Hammer's residents. Clean and tidy pub that looks geared up for serving loads of meals, yet no-one seemed to be eating the reasonable menu. I suggest they offer kids more than just chips chips chips chips etc. Nice pub, friendly landlord, great live music!